An endophytic Bacillus amyloliquefaciens strain called C5, able to produce biosurfactant lipopeptides with a broad antibacterial activity spectrum, has been isolated from the roots of olive tree. Optimization of antibacterial activity was undertaken using grape seed flour (GSF) substrate at 0.02, 0.2, and 2% (w/v) in M9 medium. Strain C5 exhibited optimal growth and antimicrobial activity (MIC value of 60 μg/ml) when incubated in the presence of 0.2% GSF while lipopeptide production culminated at 2% GSF. Thin layer chromatography analysis of lipopeptide extract revealed the presence of at least three active spots at Rf 0.35, 0.59, and 0.72 at 0.2% GSF. Data were similar to those obtained in LB-rich medium. 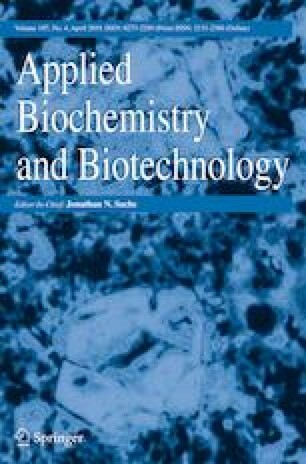 MALDI-TOF/MS analysis of lipopeptide extract obtained from 0.2% GSF substrate revealed the presence of surfactin and bacillomycin D. These results show that GSF could be used as a low-cost culture medium supplement for optimizing the production of biosurfactants by strain C5. The online version of this article ( https://doi.org/10.1007/s12010-018-2885-1) contains supplementary material, which is available to authorized users. This work has been financially supported by the “Tunisian Ministry of Higher Education and Scientific Research.” We would like to thank Professor Ezzedine Aouani for valuable discussion and critical reading of the manuscript. No studies have been conducted with human participants or animals in this article.